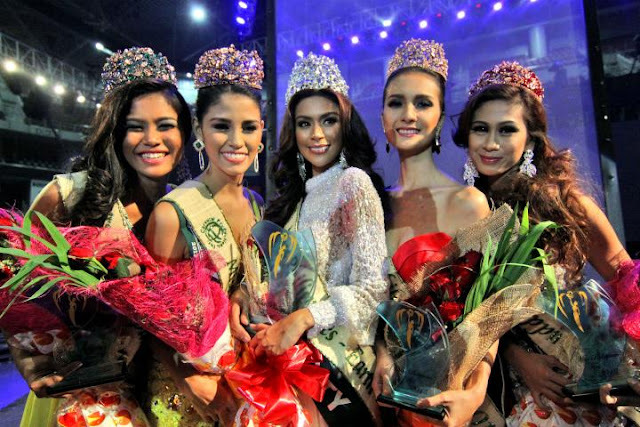 The new Miss Philippines-Earth 2013 is Angelee Claudett delos Reyes (center), 25, of Olongapo City who was crowned Sunday, May 19 at the SM Mall of Asia Arena in Manila. In the photo she is joined by her court (L-R): Miss Philippines Eco-Tourism Bernadette Mae Aguirre of Sta. Maria, Bulacan, Miss Philippines-Water Nancy Leonard from Zamboanga City, Miss Philippines-Air Kimverlyn Suiza from Nagcarlan, Laguna, and Miss Philippines-Fire Alma Cabasal representing PHL-West Coast (USA). Angelee will now represent the Philippines in Miss Earth 2013 pageant to be held in December.